Ruger Precision Rifle 6.5 Creedmoor 24 Inch Steel Threaded Barrel 5R Rifling Hybrid Muzzle Brake RPR Short-Action Handguard MSR Folding Adjustable Stock 10 Round Precision Rifle With Hybrid Muzzle Brake In-line recoil path bolt action rifle with long range capability. Upper receiver and one-piece bolt are precision CNC-machined from pre-hardened 4140 chrome-moly steel. 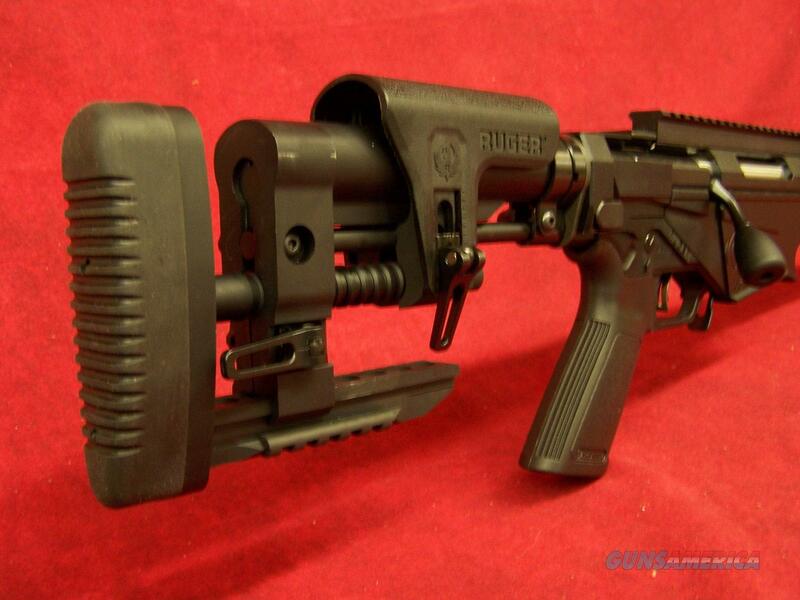 Left-folding stock hinge is attached to an AR-style buffer tube and accepts any AR-style stock. Features a Precision MSR stock, adjustable for length of pull and comb height, and includes multiple QD sling attachment points, a bottom 20 MOA Picatinny rail with four #8-40 screws for increased long-range elevation capabilities. Soft rubber buttpad. Length of pull is adjustable from 12.0 inches to 15.5 inches. Extended trigger-reach AR-style grip; 45 degree reversible AR-style safety selector. Equipped with a RPR Short-Action handguard. Multi-Magazine Interface functions interchangeably with side-latching M110/SR25/DPMS/Magpul PMAG magazines. Medium contour, cold-hammer forged 4140 chrome-moly steel barrel with 5R rifling and features a Hybrid muzzle brake (includes thread protector). Ruger Marksman adjustable trigger is externally adjustable from 2.25 to 5.0 pounds. Upper receiver and one-piece bolt are precision CNC machined from pre-hardened 4140 chrome-moly steel. Oversized bolt handle. Billet aluminum bolt shroud. Three-lug bolt with 70 degree throw features dual cocking cams. Magazine well front is contoured for a positive grip for bracing against shooting supports. Includes two 10-round Magpul PMag magazines.